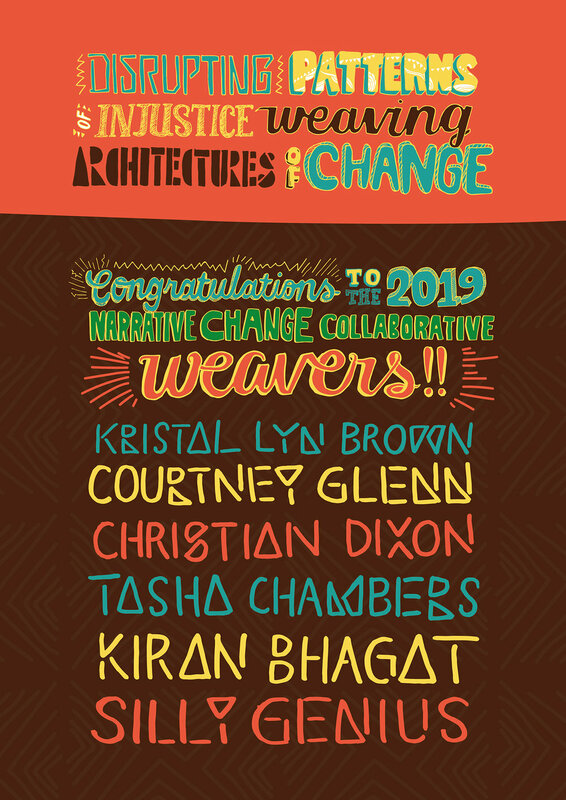 We are happy to announce the six Weavers who were selected for the 2019 Narrative Change Collaborative. Over the course of this year, the Weavers will work with Architects (faculty advisors) and each other to craft and implement projects that will unearth hidden histories about the Richmond Region in an effort to tell fuller and more inclusive narratives about how are city, state and nation developed over time. Each month, The Weavers and Architects will gather to learn and work collaboratively at a different cultural institution in Richmond including The Valentine Museum, Studio Two Three, the Virginia Museum of Fine Arts, 6Pic Innovation Center, and the Black History Museum. 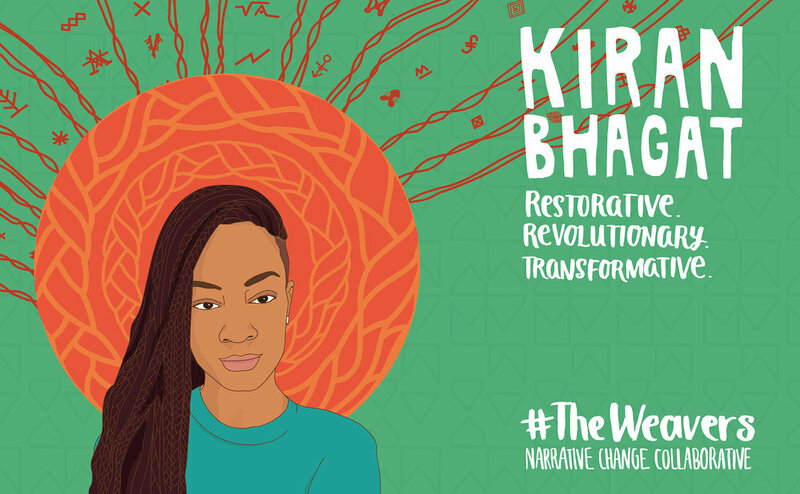 The Narrative Change Collaborative illustrations were created by NZILANI SIMU, a visual artist and designer based in Nairobi, Kenya. We are honored to have The Weavers form the first cohort of the Narrative Change Collaborative (NCC). We also recognize the important work that all the first-year NCC applicants are making as Richmond's Narrative Changers! Christian Dixon, born in Richmond, VA and bred in Austin, TX, has been on a life long mission to change how Richmond is viewed and experienced. As a self-described "multipotentialite," Christian operates loosely between visual and social design to create solutions to problems he's lived through firsthand such as a lack of diversity and opportunity for people of color in tech innovation industries. Christian co-founded ATLX, a community and social design agency established to reconcile such issues in Richmond and across the nation by creating specific, far-reaching and effective solutions. Tasha Chambers is owner and founder of The InnovateHers, a women-owned, boutique communications agency. For more than 15 years, she has created culturally-competent programming and communications campaigns for diverse brands. With a niche in nonprofit communications that amplifies the voices of marginalized communities, she has served some of Richmond’s most progressive nonprofit leaders and organizations. Tasha is a graduate of Howard University, where she earned a Bachelor of Arts degree in journalism. In 2016, she earned her place on Style Weekly’s “Power List” for leading the relocation and reopening of the Black History Museum & Cultural Center of Virginia. Kiran Bhagat is an international yoga Instructor, wellness pioneer & mindfulness influencer. She is passionate about increasing the energetic capacity of people of color whose ancestry traces back to African and Aboriginal or Indigenous roots. Kiran teaches and promotes yoga, agriculture and meditation as a practice of “Spirit Before Work.” Kiran shares her journey of “Emotional Emancipation” and wellbeing with people from all walks of life, through the transformational and powerful practice of YAMS. Courtney Glenn is a Birth Worker of Color and Principal Member of Birth In Color RVA. She is committed to changing racist narratives and negative outcomes in pregnancy and birth. With a keen awareness of the maternal health disparities experienced by Black Women in the U.S., she has made it her life’s mission to serve women and families during such a sacred, special time. Through her work, she informs, educates, and supports women, families, and communities by providing education, resources, and relationships that positively impact the birth experience and their lives. Courtney hopes to empower other Birth Workers of Color to effectively continue the work while pursuing her personal goal of nurse midwifery in the near future. Kristal is a proud graduate of North Carolina Agricultural & Technical State University (B.S. Biology) and Meharry Medical College (Masters of Science and Public Health). She is currently a doctoral candidate in the Department of Health Behavior and Policy at Virginia Commonwealth University. Kristal is also a member of Delta Sigma Theta Sorority, Inc. Kristal’s long-term career vision is to build a programmatic line of research focused on developing novel lifestyle interventions to improve health outcomes among high-risk African American women during their transition into early adulthood. Taron Sparks, better known as SillyGenius, is an artist and all-around creative. He is also the director of the All City Art Club. SillyGenius has been making art since childhood and learned a great deal through fellowship with other artists. Witnessing the transformative power of art in his Southside Richmond community has inspired SillyGenius to use art to create curiosity, wonder & an audacity to change the world.